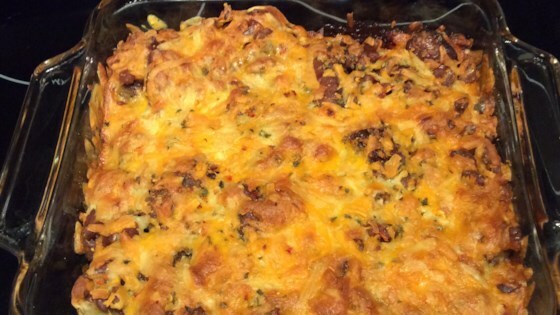 "Potatoes, beans, sausage and cheese...this is definitely 'stick to your ribs' fare. It's savory, spicy and slightly sweet all at the same time!" Heat one tablespoon olive oil in a skillet over medium heat. Add the garlic, and cook for 30 seconds. Stir in the onion, oregano, parsley, salt, and pepper. Cook for 1 minute, and remove from heat. Spread 1 tablespoon olive oil over the bottom of an 8x8 inch glass baking dish. Layer the sliced, cooked potatoes in the dish. Top the potatoes with the onion mixture. Arrange sliced sausage over onions. In a small bowl, stir together the brown sugar, baked beans, and barbecue sauce. Pour evenly over the sausage. Top with shredded Cheddar cheese. Bake in preheated oven for 45 minutes. Serve! Excellent recipe. We enjoyed it. This is the ultimate comfort food! Takes a bit of work, since you have to cook the onion mixture and brown the sausages, but it's well worth it! A big hit every time I serve it! I found it better to just partially cook the potatoes so they don't turn to mush and to sprinkle the cheese over the beans 10 minutes before done. I was making this dish for 30 people, and to save money I substituted 30 hot dogs and 1 package of American cheese.... everyone loved it! Thank you for this great recipe!